When we moved to southeastern Pennsylvania in 2011, we had great fun discovering all the fun things to see and do in the Philadelphia area. How to get around. 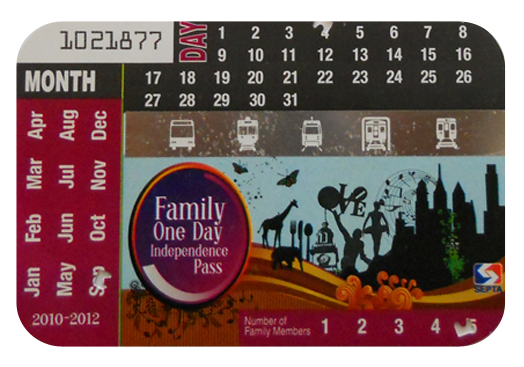 After 9:00 a.m., a family of 5 (2 adults) can travel from Thorndale to Center City, travel on the trains, buses, and the (seasonal) Phlash trolley, and go home again for the low, low price of $29 with a Family Independence Pass. (Individuals can ride for a day for $12.) It also allows you to avoid exorbitant parking fees — it can be tough to find a place to park for a day for less than $20. Discounts and deals. Families on extended stay might also appreciate a Philadelphia CityPASS, which gives you discounted rates on popular attractions for nine consecutive days. For history buffs, you really can’t beat downtown Philadelphia … Independence Hall and Liberty Bell are completely free to visit (you’ll want to reserve a spot ahead of time between March and December). My favorite feature is the “Once Upon a Nation” storytelling benches located around the historic district, and as far afield as the Valley Forge National Historic Park. Lovers of the arts can visit the Philadelphia Museum of Contemporary Art (open Wednesday through Sunday) free of charge. The Edgar Allen Poe National Historic Site commemorates the six years this literary giant lived in Philadelphia (open Friday – Sunday, 9 a.m. to 5 p.m. Free of charge). Be sure to check out the basement, which was his inspiration for “The Black Cat.” In August, Rittenhouse Square has Concerts in the Park. Foodies will love the city, too. First stop should be Reading Terminal Market, where you can get everything from handmade soft pretzels and other Amish specialties to fresh kielbasa, absolutely fresh seafood, and of course the iconic cheesesteak. Plus the best black-and-white cookies this side of NYC. Live jazz on Fridays from 12-2 p.m. If you’re willing to drive a bit further, check out the Adventure Aquarium (not free, unless you have the CityPass, but where else can you pet baby sharks and sting(less)rays on the same morning? Another family favorite is the Valley Forge National Park, where you can roller blade, walk the dog, and picnic on a bench while listening to first-rate storytellers recount the trials and tribulations of George Washington and Company (seasonal). All for free! If you’re willing to drive even further, it is possible to visit Hershey Park without paying a dime, by riding the factory simulator (assuming you can get out of the gift shop without splurging on the chocolate). Or you can just go to Lilitz, PA and visit the Wilbur Buds Chocolates, and watch the candy being made right before your eyes! Next week I’ll be hosting a guest post from a mom from Chicago! If you’d like to share your favorite family activities in your area, please send me your article at Heidi(dot)hess(dot)saxton(at)gmail(dot)com.